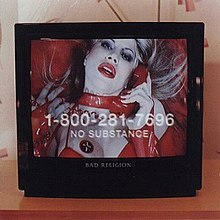 "The Biggest Killer in American History"
No Substance is the tenth full-length album by the punk rock band Bad Religion. It was the band's third (or fourth, if the reissue of Recipe for Hate is counted) release on Atlantic Records, and their second studio album since guitarist Brett Gurewitz's departure. No Substance was anticipated by both music critics and fans as a result of the band's previous worldwide successes with their 1994 major label debut Stranger Than Fiction and its 1996 follow up The Gray Race. The album has been met with mixed reviews and was not as successful as band's past releases. The album was re-released by Epitaph Records on September 15, 2008. No songs of the album would turn into live staples with the exception of Raise Your Voice which is occasionally played live in Germany due to Campino's involvement in the recording of the song. Campino from Die Toten Hosen - guest vocals on "Raise Your Voice!" "The State of The End of The Millennium Address" is written like a speech, very similar to the beginning of "Voice of God is Government" from How Could Hell Be Any Worse?. If you dial the 800 number, it will link through to ConAgra Foods customer service (No longer in service - 4/16/2017). On the CD release, Campino sings alternating lines on "Raise Your Voice". On the vinyl version, he only provides backing vocals. ^ "CG: bad religion". Robert Christgau. Retrieved 2012-03-03. ^ Milner, Greg (June 1998). "Reviews". Spin. 14 (6): 138. ^ Jacks, Kelso (June 1998). "Reviews". CMJ New Music Monthly (58): 36. ^ Bacon, Scott (May 31, 1998). "Corgan is one sensitive Pumpkin on `Adore'". Indianapolis Star. p. I4. ^ Johnson, Robert (August 12, 1998). "Quick Spins". San Antonio Express-News.